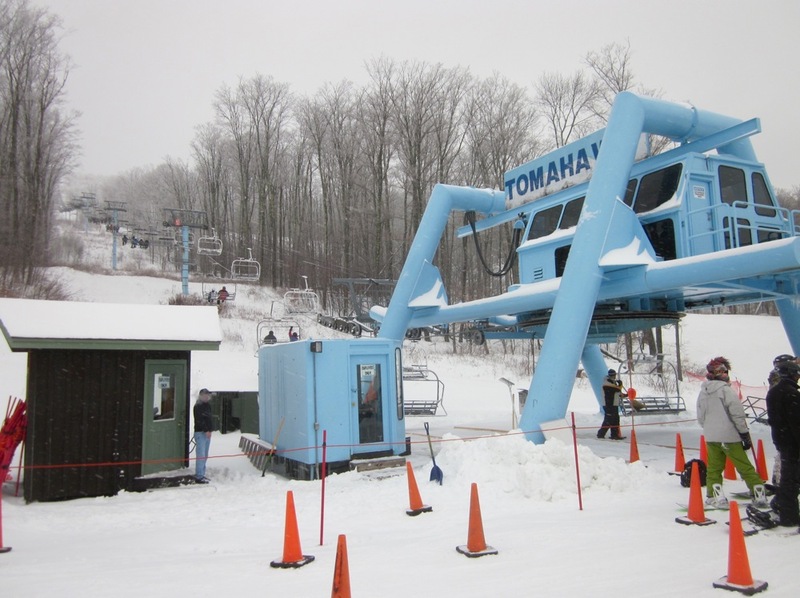 On the drive up the Thruway Saturday morning for my inaugural ski day of the 2012-13 season in the northeast, I thought about the endless discussions in the NY Ski Forums about ORDA taking over the management of Belleayre, the state-run ski area in the western Catskills. During the off-season, I’d read threads arguing the pros and cons of such issues as free skiing for seniors, the extensive ticket discounts and giveaways of years past, and the number of employees per skier visit. I’d also heard glowing reports from a couple longtime employees who were ecstatic about ORDA’s efforts to transform Belleayre into a fiscally prudent ski area. However, with up to a half foot of new snow in the forecast for the day, my immediate concern was less about ski-area politics and more about getting on the hill as soon as possible. 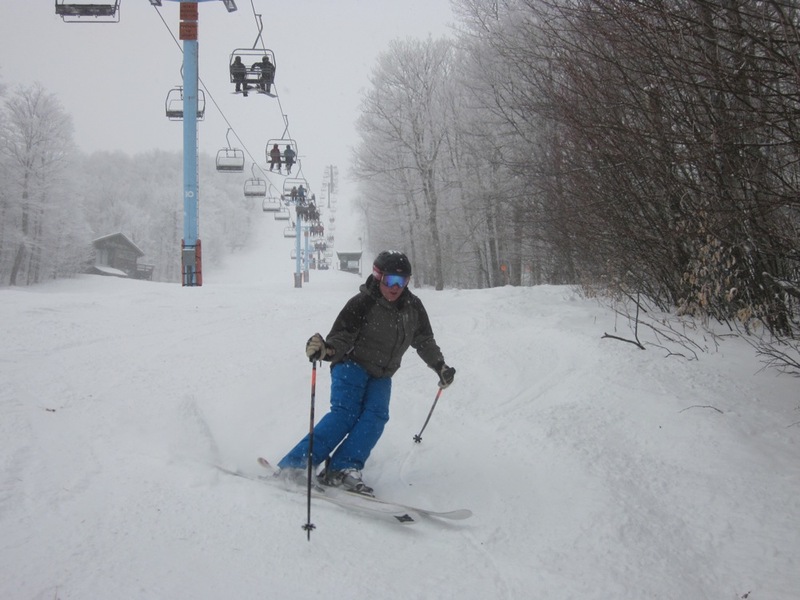 After a gruesomely poor start to the Eastern season, the weather had finally shifted into a favorable pattern resulting in more than two feet of snow in the previous days, which allowed Belleayre to open a majority of its terrain for the holiday week (and is now at almost 100%). 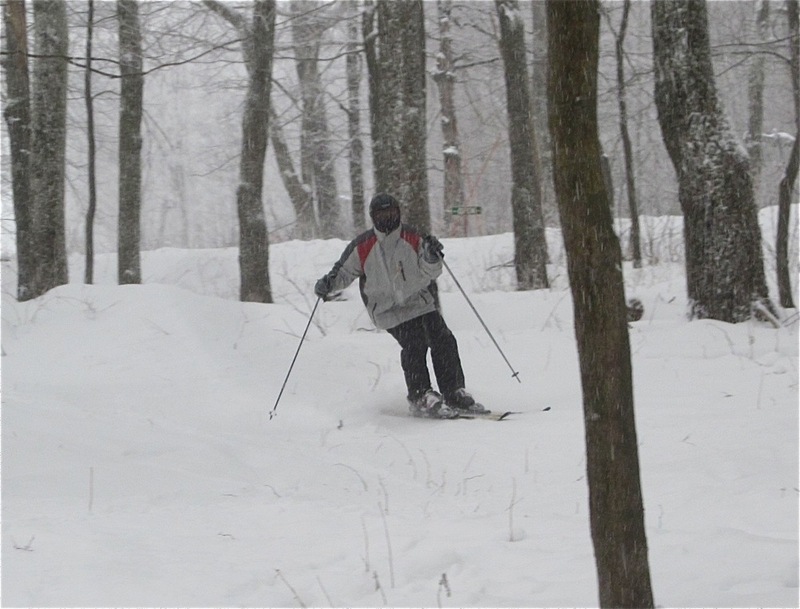 Following a few warm-up runs off the Super Chief chair, featuring a scratchy upper mountain followed by buttery smooth intermediate trails, we zipped into the glades alongside Belleayre Run and Winnisook and found beautiful soft snow with just enough coverage to conceal most of the rocks and logs. Once again, I was reminded of how little snow is needed to put a decent portion of the woods — in my mind, Belleayre’s most underrated asset — into play. As the snow fell at an inch an hour through the end of the afternoon, we lapped the Lift 7 and Tomahawk chairs — which, despite the holiday crowds, were virtually ski-on the entire day — and found creamy bootcuff-deep snow in the woods, under the Tomahawk chair, and along the sides of the trails right up to the final bell. While I did notice few minor changes that have occurred since last season (including wireless internet in the lodge, ticket scanning at the lifts, and no more discount lift tickets available at local ski shops), Belleayre still feels like the same old-school, family-friendly ski hill that it was before the management change. In the coming weeks, we’ll have more coverage about the present and future of Belleayre under ORDA. It is great that the Bell is in mid season form so early. I heard they did some improvement to the lodge, like a non-slip floor downstairs. Looking forward to getting up there in the next couple of weeks..
Man those trees look good! I’d love to know the dollar value of big holiday snowfall to the eastern ski industry. Huge. I was ready to race down here to give them some praise BUT ticket scanning? Seriously? This is my most hated ski industry practice of the past ten years. Now after driving up in traffic with people erratically navigating their iphones, I get to watch chairs float by empty as lifties fumble with tickets on knees, jackets, or through pass holders with guns that IME seem to work at odds with cold weather and snow. Sure, they’ve gotten better over the past couple of years, but there is nothing that the mountains gain that isn’t lost in goodwill from employees that actually have more time to say hi and answer questions than making sure a ticket is actually valid – which it is 99.99 percent of the time. Anyway, good on Belleayre to collect the snow that simply falls from the heavens. WiFi in the lodge does sound nice though. I guess from the simple skiers perspective – How was ORDA supposed to improve the hill anyway? All of our comments have now been lost to my rage about the futility of fun in the machine age. I hope that comment doesn’t sound crazy, I just really enjoy the underdog throwback ski experience. If they can keep some of that, which I would argue was one of Bell’s charms and introduce some modern conveniences that I would appreciate like top notch snowmaking and grooming I know that many will benefit. I feel the same way about the tickets. Belleayre has been my home mtn since I was 14, and lovelovelove the sticky tickets. I went up on a $30 day and was handed a plastic clip and scannable ticket and I probably gave the girl a look like my dog just died, only to mutter “no more sticky tickets?” — and then of course to have to have it scanned every single time I was getting on the lift. I can only imagine how hectic on busy days….bah! Just very sad to see that ticket changed. Broke a little piece of my heart haha. Heh, I’ll have to join the pile-on and say that I’m not a fan of scannable tickets. The only people who probably like it less are the lifties. That said, I think that the trick to avoiding empty chairs is to scan further back in the line/maze rather than right up front. I’m curious to learn about ORDA’s immediate and long-term plans, since so many people cite the inviting, low-key ambiance as a major differentiator for Belleayre. Super Chief down for “maintanence” today, Saturday Jan 5. So on a pretty empty mountain, 10 minute lines on 7 and Tomahawk. What do they have 6-8 weekends per year, and they have to shut down their newest and fastest lift today? Give me a break!